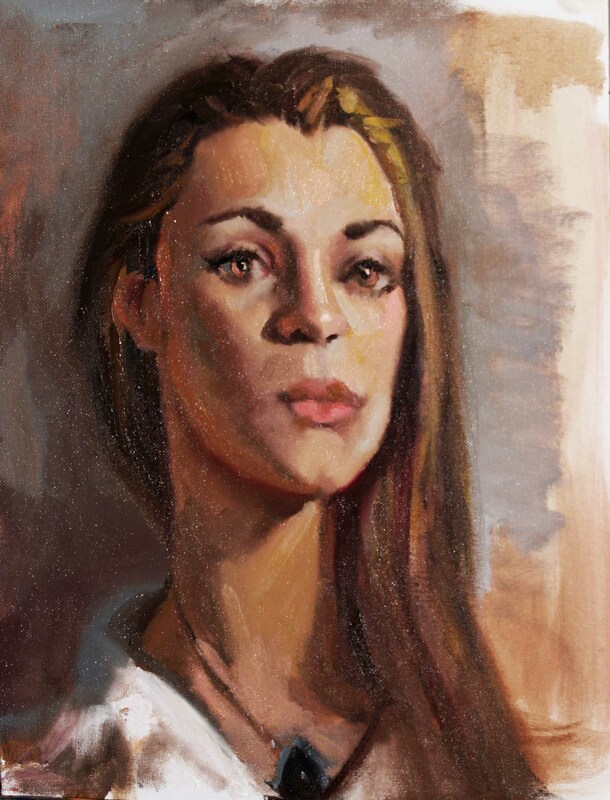 One of the things I enjoy most about teaching portrait workshops is that even though we are all working with the same method, the same palette, sometimes even the same POV, the paintings always turn out quite different. The reason is that even after all the elements of drawing, value, edge quality, etc. 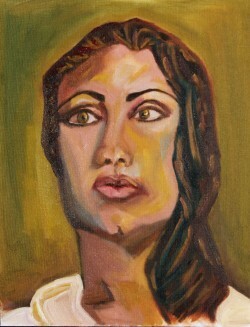 are addressed, what is left is the individual artistry and personal vision and tastes of the artist. My demo from last evening’s workshop is on the left and Cate’s is on the right. Mine is pretty accurate; it is respectable rendering of our lovely model, Alexandra. Cate’s painting, however, is an emotional study of mood and personality, an exploration of color and form that only an enthusiastic “amateur” can produce. I put the word in quotes, because, even though the elements are perhaps more crudely rendered, it may have more interest as a work of art, because it comments on the subject. It is more interpretive, more subjective. Mine is more journalistic, more objective. Yes, it too is a creative response to the subject, there is a selection of what to include and what to omit, it is subjective, but only to an extent. Mine is about the model; Cate’s is about the artist. Of course, there is a place for both approaches. There will always be those who prefer one or the other, particularly when the subject is someone near and dear to them. But in the final analysis, we don’t need to know much about the subjects in Van Gogh’s painting to appreciate his artistry. Perhaps this more subjective approach has a greater chance of standing the test of time. I suppose it all depends on who you ask. My point, is that it is this line, between skill and inspiration, that every artist must walk, precariously at times, at every stage of his or her career.